To mark the spookiness of the occasion (and to ease the pain of social interaction with minors), Mr TG and I will be taking a trip to the dark side of the cocktail cabinet and drinking a couple of bourbon cocktails that look suitably gothic, without veering into parody. Both are drinks I had been meaning to try for some time, having come across them whilst researching material for previous posts and although I do like create my own cocktails a lot of the time, sometimes it is nice to try out what's hot right now. 'Hot' is definitely an appropriate description for our first cocktail, the spookily monikered, 'Satan's Circus', which contains a thai red birdseye chilli infusion that certainly awakens the senses. The original drink was created at the NoMad Hotel in New York and named after the area which was known as 'Satan's Circus' in the 19th Century due to the profusion of brothels and speakeasies that sprang up there. According to Bar Manager, Leo Robitschek, the cocktail was created as a homage to that history and certainly, there is an air of danger to the drink. I have replicated the recipe as best I can, but the original does call for Aperol rather than Campari, so if you have some, do use that instead. However, I think it's an equally marvellous drink with Campari and Campari does tend to be easier to get hold of. Both Campari and Aperol are Bitters and taste fairly similar, although Campari is higher in alcohol content and not quite so sweet. The most obvious difference to most, however, is in their colour; Aperol is an intense orangey red and Campari, a bright ruby. 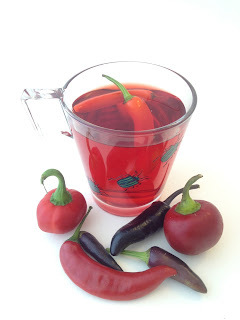 The only preparation needed for this cocktail, is to infuse the Campari/Aperol with the thai birdseye chilli, which is simple enough to do. Slice the chilli lengthways and pop it in the Campari with the stalk still on. Leave to infuse for 1 hour and then remove the chilli. Strain to remove any seeds and store in a sealed container indefinitely. Add all of the ingredients to a shaker with ice and shake hard until the outside of the shaker frosts over. This next drink also hails from New York and is an unusual, but rather wonderful take on a Whisky Sour. The idea of combining wine and spirits in cocktails is very popular in cool bars, but actually, this drink dates back to the 1870's when there was a trend for creating drinks with a 'claret snap'. Although claret refers to a particular type of wine nowadays, back then, it could be used to mean any type of red wine. 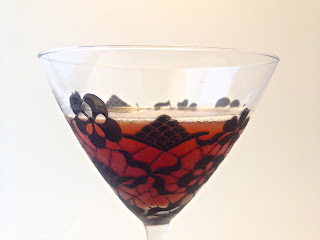 The best wine to use for this drink is something rich and fruity like a Shiraz or Malbec and I have used one of my favourites, Yellow Tail Shiraz, which is so fruity and chocolately, it's hard to stop at just one glass. 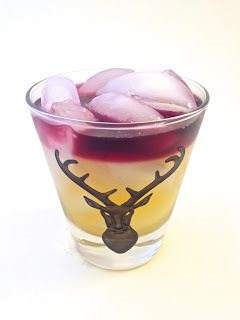 The idea is to float the red wine on the top of the drink so that it sits in two distinct layers, but I recommend that once you have admired your skill at cocktail creation, take a swizzle stick and give it a mix, as it tastes even better that way. Add the bourbon, lemon and syrup to a shaker with ice and shake hard for 30 secs. Strain into a tumbler filled with ice and carefully pour the red wine over the back of a spoon so that it floats on the surface in a separate layer. 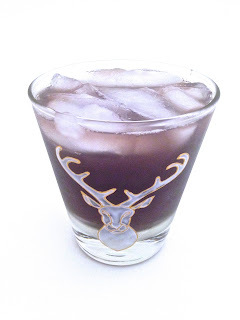 If you would like to try something suitably spooky looking this Hallow'een, I can highly recommend you try the 'Ruby in the Weiss' cocktail from my Beer Cocktail post, but to give a special eerie twist, use blue curaçao instead of triple sec. This will taste equally delicious, but the colour will turn from deep ruby to almost black.